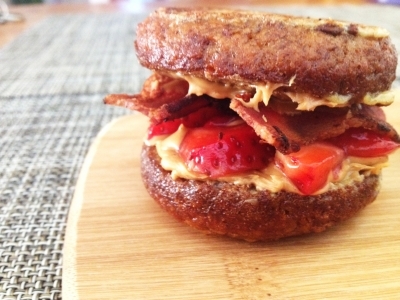 This crazy and delicious breakfast creation is 100% paleo - paleo bread, stuffed with almond butter, homemade "jam", and bacon! Yum! 1. First things first, lets make the bread! Mix all of your bread ingredients (almond flour, baking soda and baking powder, 3 eggs, egg white, honey, pinch of cinnamon, and a few dashes of salt) together with a hand whisk, and pour the batter into a muffin tin. You want each to be about half full- you'll make about 10-11 little "muffins" or so. 2. Put the muffin tin in an oven preheated to 300 degrees for 25 minutes, or until your mini breads are golden brown. 3. While your bread is baking, fry up your bacon until its nice and crispy. 4. Mix up your egg, milk, cinnamon, and nutmeg. 5. Once the bread is done and has cooled, slice the little "muffins" in half. 6. Dunk each half into the egg mixture, then toss them onto a greased griddle set over medium-high heat. Let each side of the toast cook for a few minutes before flipping. 7. Once done, remove from heat, top each side with Almond Butter (or PB if you prefer), then layer strawberries and bacon on one side. 8. Close that bad boy up and dig in! Top with maple syrup or honey if desired!